The gas analyser DEK DG-05IR is a measuring device which is developed for control and regulation of the burnt gases from combustion engines . Nitric oxide- NOx (as an option). During its work the gas analyser DEK DG-04IR is doing complex measurements which guarantee its wholeness and proper work. - Revolutions clamp and temperature sensor. Vibroaccoustic sensor for measurement of the revolutions of engines directly from the exhaust gas coming from the exhaust pipe. 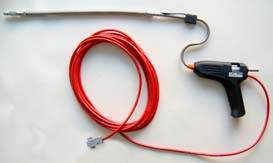 The sensor is built in the handle of the exhaust-pipe probe and it is able to convert the pulsations from the pipe into a signal, that is identical to the one from the revolutions clamp. 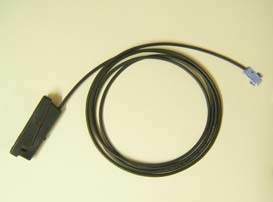 In this case the cable of the sensor is connected to the device along with the exhaust gas hose. The vibrosensor is able to work with all other brands of gas analysers, that have a revolutions input "inductive clamp". The vibrosensor has a built in divider for engines with a different number of cylinders. The choice is done by a button and the indication is with LEDs. O2 (*) …от 0 to 25% vol. (*)Absolute (% vol.) or relative (%). (*) for reaction when the values are changing from 0 to 21%. Engine revolutions – 0 to 10 000 RPM. Oxigen sensor– АО 1 “Dr. Gamberd” GMBH. Atmospheric pressure – 800 hPa to 1060 hPa. Time for stand by: < 2 min.